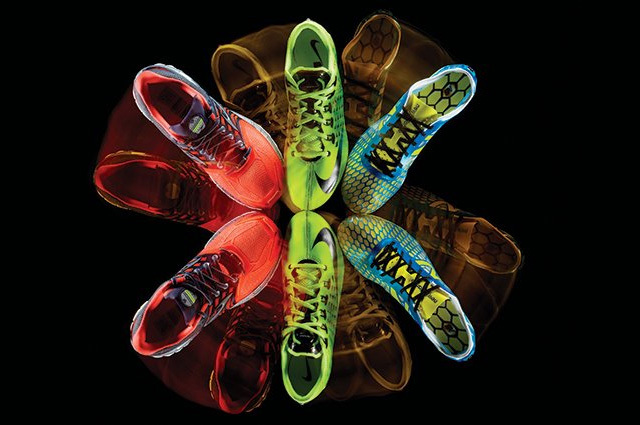 Custom-fitted shoes do more than increase comfort; they can improve performance and even reduce the risk of injury. But made-to-order shoes are also prohibitively expensive: A single foot mold, for example, can cost thousands of dollars. For those who can’t spend like a professional athlete, manufacturers are starting to adopt 3-D printing. They’re already using the process to make mass-produced sneakers that better contour to feet, but they’re also working on methods that will allow them to personalize soles, uppers—even entire shoes—from a series of 3-D scans. One day soon, a pair of custom-made shoes could run hundreds, instead of thousands. The more panels on a shoe’s upper, the more seams there are that can rub a foot raw. The Glycerin 11’s upper has almost no seams; a 3-D printer deposits 15 to 18 layers of a liquid polymer over a fine, molded mesh to fashion it. The nearly stitchless panel makes the shoe more form-fitting, more pliable, and more comfortable. In February, Nike debuted the Vapor Laser Talon, a football cleat whose 3-D–printed spikes are positioned forward to aid acceleration during the 40-yard dash. In the future, designers could modify their computer models to tailor shoes for other sports and positions, whether shortstop or linebacker. They could change cleat patterns to help boost a player’s speed, grip, or ability to move laterally. This year, designers at New Balance started printing track spikes for their sponsored athletes. Eventually, they plan to expand the program and print shoes for amateur runners, too. Because most runners want the support of a cushioned midsole, the engineers are working to incorporate printing methods that produce compressible parts. Unfortunately, there’s no set timeline for the rollout. This article originally appeared in the July 2013 issue of Popular Science.